UPDATE: $1229.18 was raised to aid the victims of the Oklahoma tornadoes… thank you for your investment in the lives of others. But we’re not done! 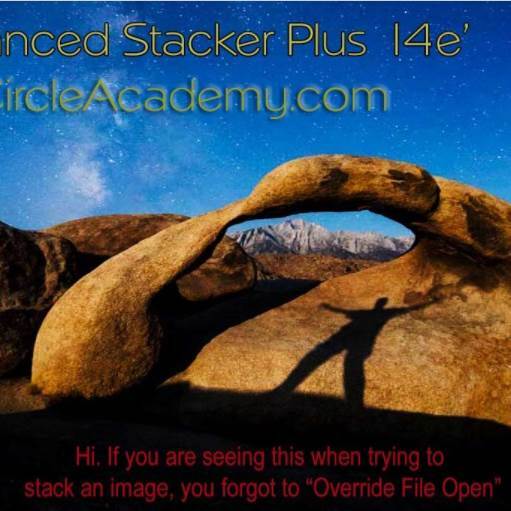 Through June 1st, StarCircleAcademy will donate $6 for every stacking action sold… and you can also get a $5 discount by using the coupon code below. I don’t like to admit it but having lived through the Loma Prieta earthquake, and being a first hand witness to the devastation of a tornado in North Carolina I have a serious soft spot in my heart for those who suffer disaster. And I have an eager desire to help. I hope you do too. Brian Drourr lives in Vermont. We’ve never met though I admire his photography. But more I admire his willingness to help out with the Moore, Oklahoma Tornado disaster. I want to do my part, and I hope you too will find a creative way to help those in Oklahoma. I have made donations, but I’d like to do more. So here is what I am doing. From May 20th through May 25th we donated 100% of all proceeds to aid the victims of the Oklahoma Tornadoes. But we’re not done! From now through midnight, June 1, 2013 we will donate $6 for each sale of the StarCircleAcademy Advanced Stacking Action to aid in the disaster relief – the proceeds will be divided between the American Red Cross Disaster Relief and direct donations to one family in Moore, OK. Use the coupon HelpOK for a discount off of your purchase. See the comments below for the current totals raised. I figure this way YOU can get something you can use, and the victims in Oklahoma will get something they need. PS I am about to release a new Advanced Stacker+ Everyone who purchases the stacking action now will get a free upgrade, and the Advanced Plus IS compatible with Photoshop CS3 – and probably CS2, but we haven’t finished testing it there yet! 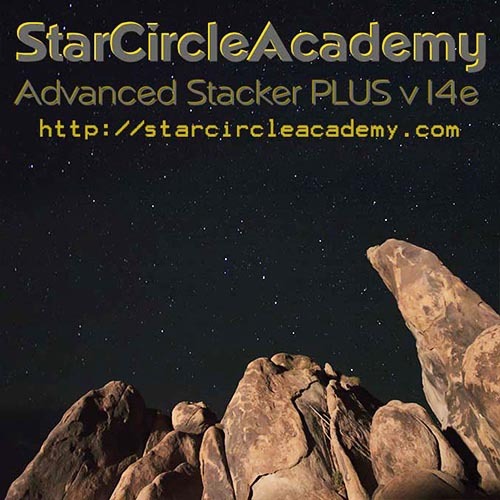 Includes the even EASIER to install Advanced Photoshop action set version 14E, an unlimited viewing online video on creating star trails, notes (PDF) on creating star trails and practice files. The video is 2 hours long. This action is power. You can create star trails, cloud timestacks and stack images with a minimum of effort and a maximum of control. You can create "comets", "midgets" streaks and much more. And you can create intermediate files along the way to put interesting motion effects into your timelapse. Compatible with Photoshop CS6 (standard or extended), CC, CC 2014-2018. While we have every reason to believe compatibility with CS3, CS4, CS5, and CS5.5 still works, we have no means to test these. **NOTE: MAC Users with Yosemite or El Capitan, or Sierra and PS CC 2015 or later are reporting installation problems. We recommend you do NOT purchase this product until we have been able to resolve this issue. NOTE: We believe ASP DOES work properly with High Sierra and CS6 and CC 2018. NOT Compatible with Photoshop Elements, or Lightroom. Please specify your primary OS and Photoshop version when ordering. You will receive links to both Mac and Windows installers. This action is power. You can create star trails and stack images with a minimum of effort and a maximum of control. You can create "comets", "midgets" streaks and much more. And you can create intermediate files along the way to put interesting motion effects into your timelapse. Version 14e also preserves EXIF data, includes Ultra Long Streaks and more! Compatible with Adobe Photoshop CS5 through CC including CC 2018. Not compatible with any other version of Photoshop, particularly not compatible with Photoshop Elements or Photoshop Lightroom. **NOTE: MAC Users with Sierra, Yosemite or El Capitan and PS CC 2015-2018 are reporting installation problems. We recommend you do NOT purchase this product until we have been able to resolve this issue. Operation with High Sierra and Photoshop CS6, and CC 2018 is believed to work fine. Indicate your operating system and Photoshop version. If you have more than one, please indicate which you use the most. You will be sent links for BOTH the Mac and Windows versions. You can also look HERE for a FREE stacking action to test drive. There are also some instructional videos that will help. This entry was posted in Photo Processing, Photoshop, Stacking, Tools and tagged advanced stacker, benefit, comets, donations, oklahoma, plus, relief, stacker, stacking, tornado on May 22, 2013 by Steven Christenson. It turns out the much hyped PanSTARRS C/2011L4 Comet is not living up to the hype. Unfortunately failure to meet the over exhuberant expectations is common since predicting brightness and visibility of an object like a comet is a difficult science. In fact, it’s part science, part black art and part good guessing – mostly the latter. 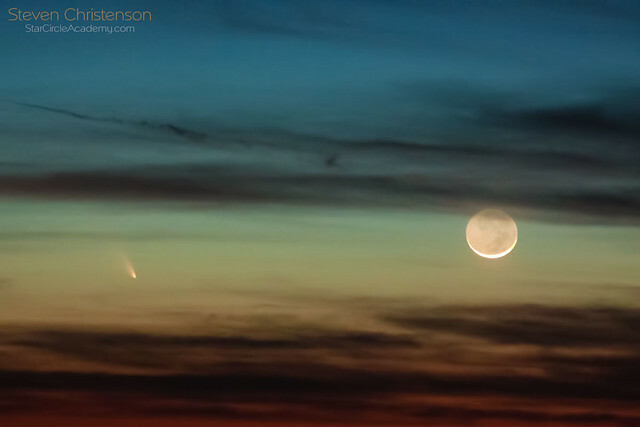 The photo above was taken on March 12 when the moon and PanSTARRS nestled closely together. The close quarters made finding the comet much easier despite the bands of clouds passing by. The strategy for finding the comet in that case was simple: use a telephoto lens, put the moon at the right edge of the photo and take different exposures periodically and at different settings (e.g. +2, 0, and -2 stops). Then hunt for smudges. The IDEAL telephoto lens would be one that was a few angular degrees wider than the difference between the moon’s position and the comet’s position. How to determine the position of each is discussed in the last section below. Figuring out the angular view of your lens is easy using online tools like this one from Tawbaware, makers of Image Stacker (like that program!). If you know the field of view at your minimum and maximum zoom, you can use that information to your advantage. There is no way you’d be able to see the comet if you were not able to find the much brighter moon nearby. On that one night, the comet and the moon were within 4 degrees of one another. That’s quite close. I know some people tried to find the comet using wide angle lenses. That strategy might work, but the comet is such a tiny thing and it’s visibility is so tenuous based on the atmosphere, light pollution, and sky brightness that you may only realize – as many did – that you captured the comet after carefully inspecting your photos at home. The truth is you are unlikely to see PanSTARRS by eye or in your camera’s view finder unless your conditions are nearly ideal. Hopefully ISON which is coming in December will be brighter and better. The following night, both the comet and the moon had moved relative to the sky. On March 13, the moon was 12.5 degrees above the comet and about 4 degrees farther west (again, how I knew this is coming in just a minute). So one simple strategy for finding the comet would be to zoom your telephoto lens so that it has a field of view of about 14 to 15 degrees in the long direction which for me, is 80 millimeters focal length on a 1.6 crop factor camera. On a tripod with the camera in portrait orientation adjust the view so that the the moon is in the upper left of the frame. Shoot bracketed shots. Check the lower right corner of each one for the tell-tale comet smudge. Keep readjusting the view so the moon remains in the upper left for each shot. Zoom out a little bit too, in case your geometry is a little off. Eventually as it gets dark enough or the sky clear enough you should find it. In fact the way I found the comet last night without using my camera but by using my telescope. The program Clinometer (on my iPhone) measures angles. I sighted the moon with my 8″ Dobsonian telescope and measured the angle along the telescope barrel using the inclinometer program. I then lowered the altitude (elevation angle) of the telescope by 12 degrees to match the altitude of the comet. Then I slowly rotated the telescope northward until I found the comet. It wasn’t easy from my urban location, but it wasn’t impossible either. By the time I was able to find the comet it was only about 6 degrees high in the sky – that’s way too low if you have trees, hills, and houses nearby to deal with. In theory, this strategy would work with a telephoto lens or with binoculars, however, binoculars need to be steady and where I spied from last night had streetlights in the distance and the flare and glare from those streetlights made finding the faint comet nigh impossible. What if there is no Moon to Find the Comet With? Unfortunately starting on March 14th, the moon will be quite far from the comet, so the opposite strategy is required: Use a landmark in a known direction as the starting point and look “upward” from the horizon. In other words, zoom your telephoto lens so that the field of view covers the angle from the horizon to the comets altitude (angle) above the horizon. Don’t forget that as the earth spins this angle changes every minute! Orient you camera in landscape mode and point it as close as you can to the correct direction (azimuth). Look along the top of the frame to see if you’ve captured the comet. however don’t forget that I found the directional accuracy of my iPhone and iPad to be pretty poor. Being off by 5 degrees may mean looking in the wrong place. How Do I Know the Altitude and Azimuth for the Comet? Unfortunately, that’s a tough one. I use the free program Stellarium. I then added the comet to the “Solar System Data Base” (search around on the web and you’ll find instructions). I selected my viewing location, dialed in the time, did a search for good ‘ol C/2011 L4 and let it tell me the azimuth and altitude. Above I’ve dialed up the time and clicked the moon. The highlighted line shows me the azimuth (direction) and altitude (angle above the horizon) for the moon which at that time are 264 degrees or just a little south of west, and 30.5 degrees high. Clicking on the comet shows 272 degrees – a tiny bit north of west and 9.5 degrees. So now we know that the comet will be 8 degrees north and 21 degrees south of the moon – and that won’t change significantly for the rest of the night. Since we also know the direction for the comet is about due west at this time, we can apply the telephoto-lens horizon trick I described earlier. Another way you can find the azimuth and altitude is by checking my animation HERE – note that the animation is correct for San Francisco (and most places nearby). There is also a table of the azimuth and elevation in the text of the Flickr post. By the way, one way to find the right spot on the horizon is to use the sunset location as a guide. 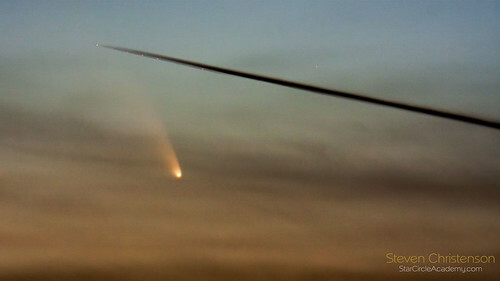 This entry was posted in Animation, Astronomical Event, Astrophotography, Lens, Photo Tip, Trivia and tagged altitude, angles, azimuth, C/2011 L4, comets, direction, finding, measuring, panSTARRS, stellarium, telephoto, tricks on March 14, 2013 by Steven Christenson.